Belongs to the world of art and stories. I’ve never gotten into abstract art, but after reading an interior design/art blog, decided to give something in particular a try. And having found my apartment suddenly lacking wall decor, I knew it was time to get cranking. So what is this? 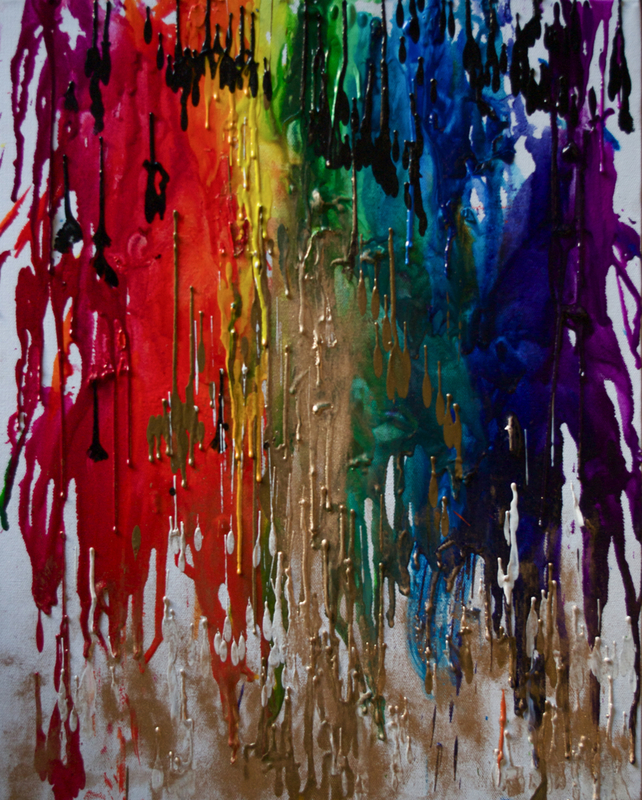 Melted crayons. No joke. I’ve been wanting to try this out for a long time, and today I finally went out and bought a pack of crayons and did it. The shimmery gold stuff is actually gold dust stuff that you can find at most art stores. I’ve been wanting to get some for a painting I started last fall and need to go back and repaint and finish. And I also needed to try it out and figure out how it works, and this seemed like an opportune time. Pretty simple, actually. Take that back… things got interesting as the crayons melted and warped. I also took a lighter and individually melted crayons as I wanted, and just let my inner artist control how things were going on this. In some way, I found that it felt more like what I was feeling now than anything else. Depression still slighting tainting what is a newly bright world, and hope welling up from inside. I’m going to be okay.